“You know, some historic California houses still have original iron ranges” Hank Dunlop remarked. At that moment we were at La Mar Cebicheria in San Francisco sampling ceviches which, by definition, never see heat. I can’t recall what connected uncooked seafood to rare wood-coal fired stoves but Hank had caught my attention. Hank has worked in the field of restoration and preservation since the 1960’s. He is a noted expert on nineteenth and early twentieth century California interiors. “There are some very impressive ranges in restored homes. 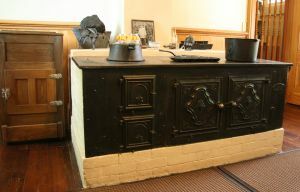 The Bidwell Mansion in Chico has what’s called a Brick-set Stove. John Muir House in Martinez has a French-set Range that appears to be the original.” Hank worked on the interior restoration plans for the Bidwell Mansion. 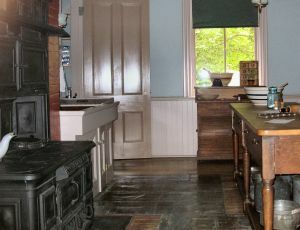 “Both of these kitchens date from the 1880’s”. My grandmother’s copy of the White House Cookbook, printed in San Francisco in 1915, was written for use with iron kitchen ranges. In the practical advise section you find “Articles Required for the Kitchen” which includes: 1 stove, 1 coal shovel, 2 coal hods and 2 coal buckets. It was not until 1910 that gas ranges were first manufactured. They were impractical until 1913 when the automatic oven temperature regulator was developed. It took another 20 years for gas to replace wood-coal burning kitchen ranges in the majority of American homes. John Bidwell was one of the first American pioneers to cross the Sierra Nevada into Alta California. Bidwell worked as business manager for John Sutter at Sutter’s Mill in 1848 and personally carried the first gold sample to be assayed to San Francisco. Later that same year, Bidwell struck gold on the Feather River. By the 1850’s he had purchased 30,000 acres in the Northern Central Valley called Rancho Arroyo del Chico. He planted vast fruit orchards, wheat fields, built a hotel, post office, flour mill and eventually, laid out the town of Chico. Bidwell was an influential Californian all his life. He was appointed a brigadier general of the California State Militia in 1860. In 1865 to 1866, Bidwell served as the California representative to The House of Representatives in Washington. His rank required a grand house in which to welcome visitors. In1868 work was completed on The Bidwell Mansion, a three story, 26-room showpiece that had gas lights, running water, flush toilets and an air cooling system. The Bidwell Mansion today is a state historic park. One wall is dominated by an elegant six-foot tall iron stove, put in during an 1880’s kitchen remodel. It is set into in a brick cubbyhole. There is an expansive flat iron cook-top. Below, heavy doors close off fire boxes where wood or coal burn. Two large ovens stand above the flat top and utilize the heat that rises from the back of the fire boxes through a flu. At the top are smaller warming ovens that probably kept a toasty supply of John Bidwell’s favorite “up-to-the-minute-biscuits”. The well known naturalist is linked with conservation of many cherished sites. John Muir’s camping trip in Yosemite, with President Theodore Roosevelt, led to the area’s preservation as a National Park. Muir helped found the Sierra Club, campaigning to establish many national monuments, including what would become Muir Woods. His books and journals were cornerstones of the American conservation movement. Today the Muir home is a National Historic Site. The kitchen has the original iron range, set on a platform of white bricks. As we peered into the ovens Irene mentioned that the Black Diamond Mine on the north face of near-by Mount Diablo provided coal for the stove. The cook kept the stove going for long hours every day to provide meals for the family, their guests and farm workers. 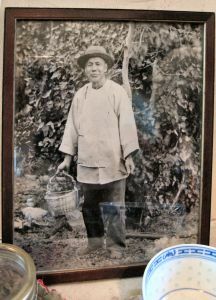 A Chinese man, prehaps the long-time Muir family cook, smiles proudly from a photo behind the stove. Nice article, Karen. I love all houses, and of course, old stoves. Roons and I will have go sometime. It’s not so far away, but seems like we never go in that direction.